"I've spoken to the coach and the father. I've tried to change their minds but I've failed to convince them. I am not in the position to hijack her, put a chain around her neck, put her in a plane, put a gun in her back and say, 'Now you're going in the blocks.' I can't do that." - UK Head Coach Charles van Commenee conceding that he can't kidnap and force 17-year-old national 60m Champ Jodie Williams to represent the UK at the World Championships. We're glad he knows this. I poured my heart into v-day gift and girlfriend calls it trite?!?!?!? Ghent: 17-Year-Old Isaiah Koech Sets Junior Record In 3K With 7:37.50 Just two days after smashing the junior indoor 5K record with a 12:53, Koech breaks the junior record in the 3k with a 7:37.50 as Ismael Kombich set new world leader is set in the 1,500 (3:34.13). *LRC MB: Isiah Koech does it again - How many youth & world junior records will he destroy? New World Record In 2,000m Indoor Steeple By Paul Kipsiele Koech Koech Ran 5:13.77 to break his own world record by 3 seconds. Jodie Williams' Coach Defends Decision Not To Race World Champs 400m runner Shana Cox will also not be competing. She is in the process of switching nationalities from the US to GB, but she will not be eligible in time to race at the World Champs. Detailed List Of 14 Charges He Was Convicted Of Screwing over Caster Semenya appears to be one of them. Czech Republic's Decathlon WR Holder Roman Šebrle Wins National Title And Aims To Medal At European Championships At 36 years old, he would be the oldest to medal ever, breaking his own record from two years ago. Karlsruhe, Germany: David Oliver (7.40) Over Liu Xiang (7.53) Liu improved .07 from his European debut 2 nights earlier. Karlsruhe, Germany Results (8:42 World Leader In 3k) American Christin Wurth-Thomas lost her world-leading status at 3k. Isiah just turned 17 at the end of December and he put on a performance to remember as he pulled away from World Champ Eliud Kipchoge for the super-impressive win. 12:53 indoors is amazing. With no advance fanfare (the track writers in Oregon didn't even write about it), American Galen Rupp was in the race in his 2011 indoor opener and ran a solid 13:21 after being on 13:05 pace at 3k, according to this thread. In other action, Nixon Chepseba got the narrow win over Augustin Choge in a world-leading 3:34 in the 1,500m, and Liu Xiang was 3rd in his European return. NCAA 200 Meter Record Holder Bianca Knight Just Misses 300m World Record It was her first competitive 300, but that didn't stop her from running 36.25, just .08 off the world record. Borlee Brothers To Go For 600m World Record In Ghent Next Sunday, Paul Koech Will Also Go After Indoor 2,000m Steeplechase Record Yes, indoor steeple. *John Hancock And Boston Marathon Do Not Make An Offer To Meb To Run This Year's Race Races have limited funds, and Boston's are way more limited than New York or London's, but it shows the financial realities of our sport when the Boston Marathon does not even extend an offer to America's top marathoner the last decade to run its race. That is what Meb Keflizighi is saying happened on his website. Perhaps Boston did not want to insult Meb with a low offer. We reached out to the BAA and Boston on this matter and they chose not to comment on it. *Full John Hancock Release Reigning champs Robert Kiprono Cheruiyot & Teyba Erkesso will defend their titles. Runner's World: A Brief Chat With Nick Arciniaga He got 2nd place at the Houston Marathon and a PR after rabbiting a teammate for the first 25k. When Girls Train With The Boys HS girls talk about the benefits, the differences, and the awkwardness of dealing with "boy conversation." Coming March 20th: NYC Half Marathon: Meb, Hall And Abdi! Keflezighi Leads American Men Into NYC Half Marathon Meb Keflezghi, Ryan Hall and Abdi Abdirahman have not all run in the same race since the 2009 NYC Marathon, where Meb won, Hall was 4th, and Abdi 9th. These are three of the six fastest American half marathoners of all time, with Hall holding the US record at 59:43. But the big news is that Meb implied in Tuesday's teleconference that he has been unable to reach a deal with the Boston marathon and as a result, Meb says it will be an unusual race for him because he is not using it as a tune-up for a later marathon. 17-Year-Old World Junior Silver Medallist And 8:23 Steepler Albert Yator Dies From Malaria Yator's death was a surprise and is a very tragic reminder that malaria is not just something we read about in the newspaper and should ignore. Some Positive Distance News: Track & Field News Profile On Andy Bayer The 2011 breakout star will redshirt outdoors. LRC Boston News And Notes Russell Brown thought he had a 5% chance to win, Nick W trying to lead, and Leo M okay with losing to Verzbicas. Plus Sam Chelanga says LetsRun.com is cool as long as you don't leave your family because of it. Cathy Freeman Pregnant With Her First Child This news of course has made tabloid headlines in Australia, where Freeman is an icon. The pregnancy has triggered Freeman's Type 2 diabetes, but she appears to be doing well overall. Russell Brown Cruises To 3:54 Win, Webb, Manzano And Verzbicas All Over 4 The men's mile featured Alan Webb, Leo Manzano, Nick Willis and high school star Lukas Verzbicas, but the star of the night was Russell Brown, who crushed the field winning in 3:54 as Webb, Manzano and Verzbicas all didn't break 4. Afterwards, Webb threw a tantrum (seriously, that's a fair way of describing it) before addressing the press, and we'll have more on that Sunday. In other action, Sally Kipyego turned back Jenny Simpson in the 3k, Phoebe Wright got another win in the 800m, but the performance of the night may have been Dejen Gebremeskel running 7:35 and outkicking Mo Farah with a last lap of 26 while having one shoe on for most of the race. Post-Race: LRC Alan Webb Throws A Tantrum After Disappointing Opener Alan Webb's competitive fire is legendary and the dark side of that competitive fire was on full display after Webb's disappointing performance. We've seen many athletes get upset, but none like Webb on Saturday night, especially after an earlier season opener. We've got the details and try to give some perspective to Webb's behavior. On The Boards: That Webb article is a breach of professional decorum. Wejo explains here, here and here our thoughts for this story and why it was reported. Ashton Eaton Shatters His Own World Record In Heptathlon! Eaton scored 6,568 points to break his own world record by an impressive 69 points, setting PRs in the shot, 60m, and 60m hurdles. His hurdles time of 7.60 seconds was so good it would have won the 2008 World Indoor Champs and actually breaks the hepathlon record of 7.74 held by Olympic decathlon gold medalist Bryan Clay. Yenew Alamirew Runs 7:27.80 To Lead 3 Under 7:30 Barrier For First Time Ever, David Oliver Runs Fast In Hurdles Alamirew dominated a late season 3k last year and backed it up here, showing he is the real deal. For the first time ever indoors, more than one guy broke 7:30 in a race, as Alamirew triumphed over Augustin Choge and Eliud Kipchoge. David Oliver easily dispatched Dayron Robles and nearly got the US record, and LRC favorite Silas Kiplagat lost in the 1,500m. LRC Lukas Verzbicas Talks To LetsRun.com It takes a true phenom to get LetsRun.com excited about a high schooler, but we're now officially leading the bandwagon, as we caught up with America's greatest high school phenom (since the Hall-Webb-Ritz era) two days before he tries to join Webb in the sub-4-indoors-as-a-HS-runner club. A natural showman of sorts, Lukas talked about his goals for Saturday, his training, his decision to go Oregon, whether he contemplated going pro straight out of HS, and much more. A must read. Millrose Behind The Scenes: Lagat Goes Down, Millrose Entertains Employee #1 and his able assistant went into the bowels of Millrose to tell you what really happened at the grand-daddy of track and field meets in the world. High schoolers flashing U of O symbols, overlooked 3:34 1,500m runners, and pros addicted to LetsRun.com - we've got it covered. 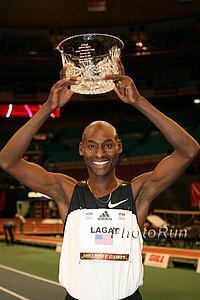 Unlucky 7: Deresse Mekonnen Snaps Bernard Lagat's Winning Streak At 6 The 23-year-old 2010 world indoor champ defeated the 36-year-old President of the Boards (or did Father Time win?) in a fantastic Wanamaker mile, but not without Lagat putting up a fantastic fight that saw him at least three times try to retake the lead in the final two laps. *Register-Guard: World Pentathlon Record Holder Ashton Eaton PRs In Two Out Of Three Events To Beat Olympic Champion Bryan Clay And World Champion Trey Hardee Eaton set a new shot put PR at 46-8 and lowered his 60m hurdles time to 7.64. *Jamaicans Lose Sprint Showdown With USA Jamaicans Veronica Campbell-Brown and Nesta Carter won the sprints, but US sprinters claimed victory on points in the US-Jamaica challenge. *Millrose Games: Nadel, Noelle Win HS Miles! Injury-Prone Dathan Ritzenhein Will Now Shift Focus To 10k At World Champs *LRC MB: RITZ! ENOUGH WITH THE MARATHON! Lukas V Commits To Oregon For Real It's now official; two time Foot Locker XC national champ Lukas Verzbicas has an oral commitment to Oregon. The news was out unofficially last week. Letsrun.com has learned Lukas considered turning pro but the money he wanted wasn't there. Why would Nike pay big bucks for him when they can get him much cheaper in the U of O singlet? Creating The Annual Prefontaine Classic Poster Isn't As Easy As You Might Think Meet director Tom Jordan speaks of the difficulty of finding new photos worthy of the yearly poster. Steve Prefontaine And His Three "Brothers"
New Pro Ciara Mageean Broke Two Irish Junior Records At New Balance Mageean, whom some are calling the next Sonia O'Sullivan, finished seventh in the elite mile field (10 seconds behind winner Jen Simpson's 4:28.60) in 4:38.81 to break the 13-year-old indoor junior record of 4:41.76. En route to that record, she ran 4:17 to smash her own jr. record of 4:20.88. Only Two Scottish Athletes To Compte At This Weekend's Aviva International Meet In Glasgow, Scotland One of them is former U23 European 5k champ Laura Kenney. It's Official - Angela Bizzari To Mammoth Track Club Agree or disagree with the decision? It's a hot topic on the message board. David Barmasai earned his $250,000 the hard way. Barmasai had only run marathons in Kenya before. There were 12 guys who went through halfway in 1:02:46. At 30k, according to message board reports, the leaders were only 25 seconds off of Haile G's world record split. Then however, the wheels came off. The final 5k was run in 16:47 and that gave Barmasai the win by nearly a minute over Evans Cheruiyot (2008 Chicago champ), who won $100,000 for 2nd place. Shows how hard Haile G's record is. On the women's side, Asselefech Mergia of Ethiopia was much more credentialed coming in (bronze at 2009 Worlds) and she was the only one to dip under 2:23 but missed the course record at the world's richest marathon in terms of prize money - $1,000,000 combined between men and women; not the $2 million we said yesterday. London Olympics Will Introduce A Bye From The First Round For Top Athletes In The 100m Some say this is a controversial decision but when you consider the fact that every country is allowed to enter an athlete in the 100m, you can understand the purpose of the rule change. Does it really make sense to force Usain Bolt to race the first round against athletes such as Shanahan Sanetoa of American Samoa, who clocked 12.6 secs in Beijing? Cruise Control For Runners? No we're not talking about a treadmill. Could This Vibrating Platform Make You Better At Track? Message Board Talk: Solinsky 3:54 Mile *Webb 6th In 3k In 7:51 Tim Nelson got the win. Chris Solinsky Opens 2011 With A Remarkable 3:54 Bang!!! 5 Collegians (7 Overall) Also Do It On Illegal Track At Washington Top collegian was BYU's Miles Batty, who ran 3:55.79. 10 Guys Hit Auto In 3k At UW Pro Tim Nelson got the win as Garrett Heath almost came from way back to win, with Sam Chalenga 5th, Alan Webb 6th and German Fernandez 10th. Patrick Casey Racks Up Another NCAA Auto Mark In The 800 He ran 1:47.67, winning by 7 seconds. Another impressive solo effort to go along with his sub-4. NYC Wants New York City Marathon And Other Races To Pay Full Cost Of Police Services For Its Races The proposed rule will let police bill race organizers for the expenses of controlling traffic and shutting down roads during an event. This is a huge raise in the cost of managing races and could mean the end for many lower income events. Conveniently, this rule does not say anything about billing the Yankees, Mets, Knicks, or other professional teams for police details around their stadiums. West Ham (One That Will Keep Olympic Track) Wins Olympic Stadium Battle But Some Track Athletes Aren't Happy Some are upset a soccer team is the main tenant and some are worried the track will be ripped up in a few years. AEG Says Keeping Track In Olympic Stadium Will Bankrupt It In 10 Years AEG is the group behind the Home Depot Center in LA. They have done very little with the track there, but they do understand that a World Champs can't be hosted without government guarantees to the IAAF. 417-Pound Three-Time US Sumo Champion Will Try To Set Record As Heaviest Marathon Finisher He's already finished one, but it wasn't video taped, so it couldn't count. This one is for the record. LRC The Week That Was: Brent Vaughn And Russell Brown Surprise, Shalane Flanagan And Ashton Eaton Impress, Gebremeskel Wins With One Shoe, And Yenew Alamirew - The Next Great Star? There was a ton of incredible action last week, from Russell Brown's surprise win in Boston to the XC champs to the heptathlon to a sub-4:00 mile at altitude, and we've got it covered. We compare Brent Vaughn to Dathan Ritzenhein, wonder when Ashton Eaton will beat Bryan Clay and Trey Hardee, and ponder whether Yenew Alamirew is the next great star of the sport. Irresponsible: Marion Jones Speaks To UNC Athletes Because She Has "... insight on making good choices and accepting responsibility." She still hasn't confessed the truth on her drug use. 48-Year-Old Pat Farmer Will Attempt To Run More Than 13,000 Miles From The North To The South Pole It will take him 11 months and he will have to run two full marathons a day (burning 12,000 calories in the process). Past NCAA 400m Champ Shana Cox Is Switching Nationalities From US To Great Britain She calls the decision a "no-brainer." Don't You Hate It When Running Gets In The Way Of Your Pig Hunting? Brent Vaughn Wins Convincingly, Shalane Flanagan And The Other Winners Dominate Vaughn, the CU record holder at 5k (think about that for a second) dominated the field the 2nd half of the race to win by 6 seconds, the smallest margin of victory of the day. Shalane Flanagan totally destroyed Molly Huddle, winning by 44 seconds, and getting a little revenge for Huddle taking her 5k American record last year. Foot Locker champ Aisling Cuffe won the junior girls race convincingly. 49-year-old Master Pete Magill won in the men's masters ranks, while Colleen De Reuck showed she was in the wrong race, winning by 1:34. *Denver Post: Brent Vaughn Makes Surprising Comeback After DNFing At US Half Marathon Champs Last Weekend Vaughn was excited to "finally" get in a satisfying race and said, "I felt like I was getting the monkey off my back. It just feels good to finally get one." *San Diego Union-Tribune: Flanagan Dominated But Says She Didn't Know She Had It In The Bag: "I always run scared." LRC Ritz's Injuries, Should Chris Solinsky Get Nervous?, Runner A Vs. Runner B, The Houston Course, Millrose Announcing And The Most Overlooked Performance Of The Weekend Once a week, we go beyond the headlines to cover the running scene like no one else. So before you turn your attention to the Super Bowl, give us 5 minutes and learn what's going on in the running world. Updated at noon with more on Houston course, praise for Tim Hutchings on ESPN broadcast. A Look At Oregon's Ridiculous Recruiting Class For Next Year Lukas Verzbicas is just the tip of the iceberg. Lananna Says He's Not A Finalist For USATF Job Eugene Register-Guard The article says USATF is down to 3 finalists. The article doesn't name the finalists, but only names three people (Lananna and Mary Wittenberg, who both have publicly said they aren't interested, and Rich Kenah (former World Championships bronze medallist)). Good Read: Jerry Schumacher Profile In Portland Paper Got to be a quote of the day in here somewhere." Men: LRC Mo Trafeh Outkicks Ryan Hall Ryan Hall, Mo Trafeh and Patrick Smyth battled together on the streets of Houston for 11 miles. In the twelfth mile, Hall tried to push ahead. Smyth was the first to crack, but Trafeh stayed on Hall's heels. With 200m to go, Trafeh gave it one final surge and passed Hall to get the win. Women: LRC Jen Rhines' Return Trumps Burla's After a 4-year absence, Jen Rhines made a return to the longer distances with a win and a PR. However, her comeback was the least impressive of the day, as that award definitely goes to Serena Burla. Burla was second just as she was last year. However, in the last year, she had been diagnosed and beaten cancer. Pretty amazing. Mother of three, Nan Kennard, who trains with Colleen De Reuck, was a surprise third. LRC Week That Was: Delaware Gets The Ax, Wanjiru Crashes, Dubai Makes Some Marathoners Rich, And The US Indoor Season Gets Going As usual, we recap the week in running like nobody else. Now that the holidays are behind us, the running world is starting to heat up again. Caster Semenya Sits Down & Gives The BBC Her 1st Extended Interview Since Gender Controversy Arose Semenya said she doesn't want to dwell on the gender issues; she only wants to focus on running, but she did get irritated when asked if she was given hormonal treatment. Have Athletes Reached Their Limits? The author seems to think they have because so many world records have stagnated since the 1980s. He does acknowledge drugs played a role in many records from the '80s. However, he is perplexed by one athlete - Usain Bolt - and says Bolt's breakthroughs today are why he is so newsworthy. Track and field, by focusing on the competition and not the records, can stay relevant in our opinion. Duke Senior Kate Van Buskirk Sets Collegiate Record In 1,000 She had an incredible weekend as she ran 2:41.00 after splitting 2:04.15 on a 4 x 800. Sports Illustrated Columnist Joins LRC Faithful In Ripping Delaware For Cutting Its Men's Track & Field / XC Teams Jeff Pearlman is a little biased as he used to run for them, but that doesn't mean he's not right on the money. UD Track is 100 years old this year. Bemidji State's Men's Indoor & Outdoor Programs Get The Ax Not quite as old as Delaware, which is celebrating its 100th anniversary, Bemidji track has been around since 1928. LRC: Update On Galen Rupp's Training: Two Distinct Seasons For Rupp In 2011, More Mileage Alberto Salazar has done a tremendous job crafting Galen Rupp's career despite the critics (we specifically remember pro athletes who saw Galen train as a high schooler saying he'd burn out). Alberto says 2011 will be a bit different for Galen than 2009 and 2010, with 2 distinct peaks (and time off in between) and that there is still a lot of room for improvement in terms of training mileage. Plus, we take a look back at Galen's incredibly long and consistent 2009 and 2010 seasons. Olympic Marathon Champ And Accused Attempted Murderer Sammy Wanjiru And His Wife Supposedly Reconcile Press reports are indicating that the families of Wanjiru and his wife got involved and urged a reconciliation which may result in charges being dropped, although his wife was a bit coy in her responses to the press (as we're sure $$$ is still being negotiated). *Updated LRC MBoard Talk: "He is now officially qualified to be a professional American athlete. Can some of the women on this board tell me why abused women stay with their abuser. Often, until they are beaten to death?" LRC Week That Was: The 10 Best High School XC Runners Of All Time, Verzbicas, Tribute To Gary Reed, The NY Times & The NE Patriots And More We've got the entire running world covered from San Diego to Japan, from the high school ranks to the pros, and even talk about the NE Patriots and the NY Times.